Join us for a fantastic line up of visiting and local LGBTQ improv talent in this special Pride fundraiser. 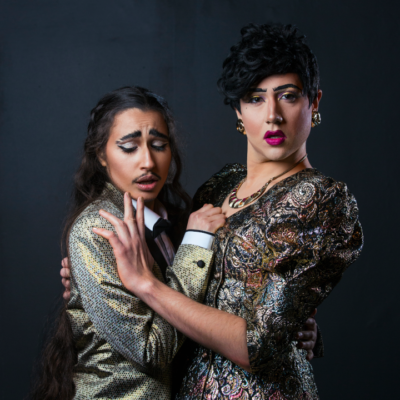 ‘Christian Adore’ and ‘Eaton Messe’ are a drag double act performed by Francesca Forristal and Ed Scrivens. Using your suggestions, this lovable soft-boy and sassy queen will create dazzling songs, sketches, and raps. It’s RuPaul’s glamour meets “Whose Line Is It Anyway” style improv comedy. With smash hit shows from the Edinburgh fringe now join the dazzling double act as they come to Bristol! Serving you wit as sharp as their contour; jinks as high as their brows; memories that will stick with you longer than last night’s glitter, we present The Dragprov Revue.